Over the years, I’ve shared some clever images, jokes, and cartoons to expose the flawed mindset of those who hope to achieve coerced equality of outcomes with redistribution and high tax rates. The size of a pizza vs the share of a slice. The modern version of the Little Red Hen. Two pictures showing how the welfare state begins and ends. A socialist classroom experiment (including a video version). The economics of redistribution in one image. As you can see, this is a common-sense issue. When you give people money on the condition that they don’t earn much money, you create a perverse incentive for them to be unproductive. Especially since, when people work more and earn more, they get hit by a combination of fewer handouts and more taxes. The net result is very high implicit marginal tax rates, in some cases rising above 100 percent. Needless to say, it’s very foolish to have a welfare state that puts people in this untenable situation where the welfare state becomes a form of economic quicksand. And it’s also foolish to punish the people who are pulling the wagon with high tax rates and pervasive double taxation of income that is saved and invested. Russell Jaffe, one of our Cato interns, helpfully cranked out a clever little image showing how redistribution is bad for both those who receive and those who pay. No wonder the welfare state and War on Poverty have been bad news for both taxpayers and poor people. And the problem is getting worse, not better. Let’s begin to wrap up. 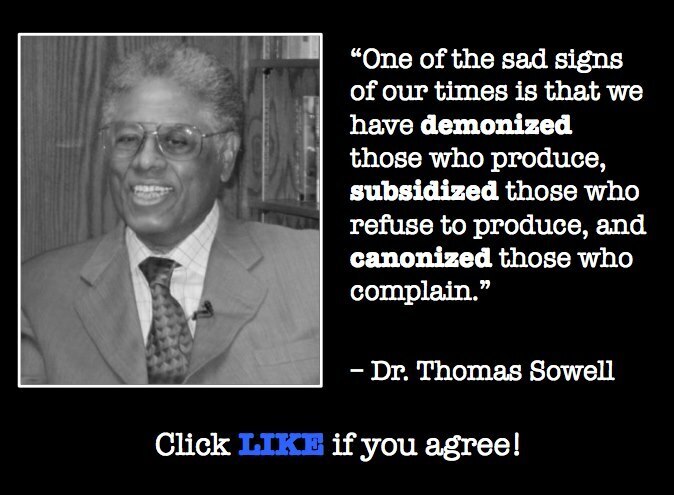 I shared a Thomas Sowell quote at the beginning to today’s column. Now let’s read some of his analysis. He aptly and succinctly summarized why redistribution is a no-win proposition (h/t: Mark Perry). The history of the 20th century is full of examples of countries that set out to redistribute wealth and ended up redistributing poverty. …It is not complicated. 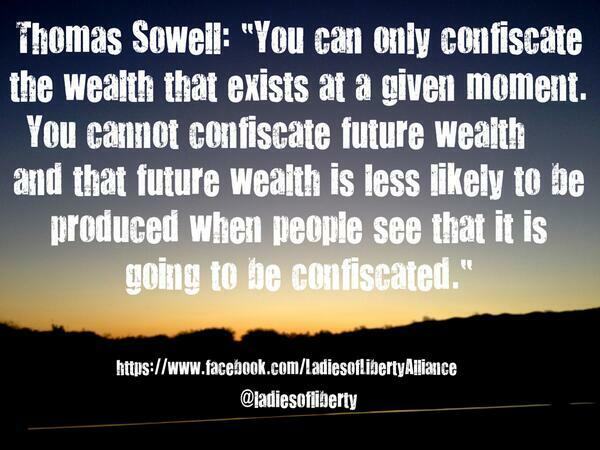 You can only confiscate the wealth that exists at a given moment. You cannot confiscate future wealth — and that future wealth is less likely to be produced when people see that it is going to be confiscated. …Those who are targeted for confiscation can see the handwriting on the wall, and act accordingly. …We have all heard the old saying that giving a man a fish feeds him only for a day, while teaching him to fish feeds him for a lifetime. Redistributionists give him a fish and leave him dependent on the government for more fish in the future. 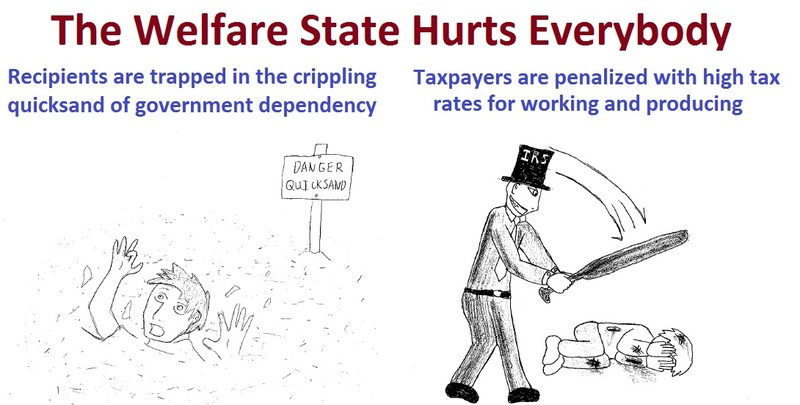 The simple (and correct) answer is to dismantle the welfare state. State and local governments should be in charge of “means-tested” programs, ideally with much less overall redistribution (a goal even some Scandinavian nations are trying to achieve). In effect, the goal should be to replicate the success of the Clinton-era welfare reform, but extending the principle to all redistribution programs (Medicaid, food stamps, EITC, etc). P.S. Some honest leftists admit that the welfare state cripples independence and self reliance. P.P.S. For those who like comparisons, you can peruse which states provide the biggest handouts and also which nations have the most dependency. P.P.P.S. To end on a sour note, our tax dollars are being used by the Paris-based OECD to produce junk research that argues more tax-financed redistribution somehow is good for growth.